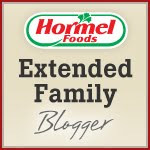 BentoLunch.net - What's for lunch at our house: Hormel January - Superbowl Time! Hormel January - Superbowl Time! The Superbowl is this weekend and it's time to start planning the menu, I think! OK, I'll be honest, we're more likely to spend Superbowl Sunday skiing at Keystone than actually watching the Superbowl, but that doesn't mean planning yummy themed food can't be fun. Our teams have long been out (Buffalo for me, Dallas for the husband), so we're sort of routing for San Franscisco, which is more of a not cheering for Baltimore plan. What kind of Superbowl food is a must have for you? Hormel has plenty of options for a traditional game menu and for a New Orleans themed one. Easy Cajun Jambalaya: Spice things up in under 30 minutes with this New Orleans favorite that will bring you to Bourbon Street in just one bite. Smoked Ham Cajun Po-Boy: Combine warm French baguettes, Hormel ®Natural Choice® smoked deli ham and Cajun seasoning for the perfect Po-Boy. Cajun Fries: Pair these with your favorite grilled entree for a complete meal that will keep you satisfied well past fourth quarter. Snacks: All the essentials in one ready-to-go Football themed party tray – enough said. Wings: No other chicken wings are even in the same league as these Championship Chicken Wings, featuring CHI-CHI’S® smooth & spicy picante sauce. Or let the barbeque sauce do the talking with Lloyd’s wide variety of shredded meats and ribs products. Dips: Hormel Foods has a variety of pre-made foods that are chip-friendly including: Wholly Guacamole®, Hormel® chili and CHI-CHI’S® salsa and queso. What about your house? Any tried and true Game Day recipes? We're always looking for yummy new ideas!